Time for a mani in my favorite colour, teal! Problem is, my camera does not like teal one bit. It wants to turn it blue. So, you might be looking at my swatch pictures and thinking that my skin colour seems....off. That's because I adjusted to colour in the photos so that the polish looks as close to real life as I could get it, because, the polish is what you came here to see! Onto the actual polish! 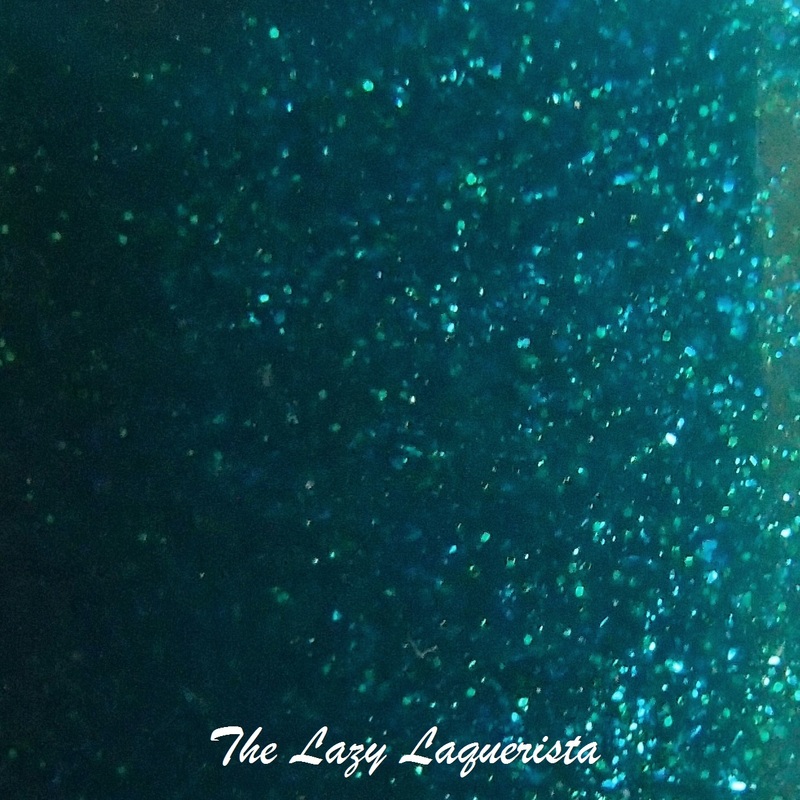 Pretty Serious Creature crush is a beautiful teal jelly base filled with teal and blue micro glitter. 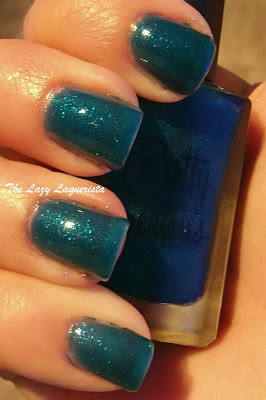 Seriously, I think this is one of my favorite teal polishes out of all the ones I own.... and I own a lot of teal polishes. After three coats this polish is about 90% opaque. If you look closely you can still see the nail line, but who's really looking that closely at your nails. The polish was easy to apply. The only downside is that it did take longer than average to dry. 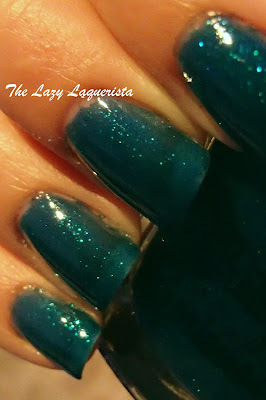 I think this is a characteristic of jelly polishes in general. Photos show three coats of Party By The Pool With one coat of CND Super Shiney top coat in indoor lighting. 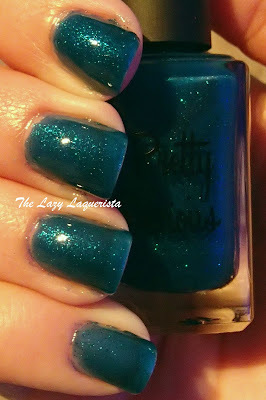 Again, I did adjust the colours in the photos after taking them so that the polish was true to life. 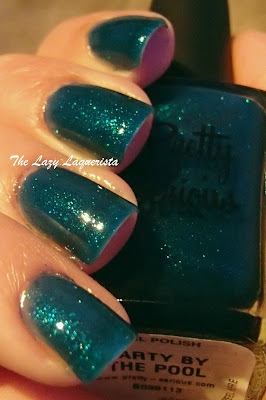 I felt a little better when I went and checked out listing on the Pretty Serious site and saw that theire photos turned out more blue than in real life too. 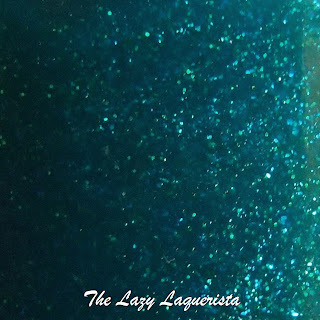 I just love the shimmer this polish has without looking overly glittery. The colour is so rich and bright at the same time. If you want a bottle of your very own check out the Pretty Serious website at http://www.pretty-serious.com/. For me, how much I love this colour totally makes up for the longer drying time. Are you willing to wait through a bit of extra drying time for a polish who's colour you love?